Yesterday the US Federal Reserve’s monetary policy committee (FOMC) decided to keep its policy interest rate unchanged. The FOMC reckoned that global economic growth was slowing and it would be risky for the Fed to hike rates at this time because its policy rate sets the floor for all interest rates on bonds and mortgages and many of those overseas. The Fed had begun the process of hiking its policy rate last December, for the first time in nine years. That was because Fed Chair Janet Yellen was convinced that the US economy was recovering on a sustained basis. US unemployment had dropped back nearly to the level before the Great Recession and inflation had begun to rise. In other words, she thought the US economy was returning to ‘normal’ (finally after eight years!) and the Fed could also act ‘normally’ with its interest rate policy. Then in January, economic data from around the world showed a serious falling away and there were fears that China would implode. That shocked the Fed’s committee. Now it appears divided between those like vice-chair Stanley Fischer who are worried that inflation is coming back and the Fed must act, and others on the committee who worry that if the Fed hikes too early and quickly it could cause a stock market crash and a new recession globally (see my post on that risk). The ‘doves’ won out this time and only one FOMC member voted for a hike. The FOMC now projects slower economic growth in 2016 than before (just 2%, similar to the latest projections from the UK government for Britain). It now waits for better economic news, but with bias towards more hikes later in the year. This ‘dovish’ turn by the Fed is being adopted in spades by the other main central banks, such as the ECB and the BoJ. Indeed, both are engaged in the opposite process from the Fed, namely of cutting interest rates even into negative territory, the so-called NIRP. That’s because the Eurozone and Japanese economies remain close to stagnation and it is deflation that is the spectre haunting these economies, not inflation. As I have explained in several previous posts, central bank monetary easing has been virtually the only policy adopted by governments around the world to try and get out of the current Long Depression. First, it was zero interest rates, then it was quantitative easing (printing money) and now it is NIRP (negative interest rate policy). And all have signally failed. Indeed, the actions of the BoJ in January and the ECB in March to introduce negative rates for banks holding cash reserves with them (designed to make banks lend and households spend their savings deposits) have not produced any positive result. On the contrary, instead of the euro and the yen falling in value, people are hoarding all their cash and these currencies have strengthened! Moreover, charging banks for holding cash at the central banks but not allowing them to cut deposit rates for their customers (as both the ECB and BoJ are doing) is destroying bank profitability. It’s been called the law of unintended consequences. The next desperate measure on monetary policy is the idea of ‘helicopter money’, i.e. putting some of money in everybody’s bank accounts, so that they can spend it and get ‘demand’ going. Actually such printing of money for people to spend directly is similar to an income tax cut. It’s really fiscal stimulus but financed not by the issuance of government bonds, but directly by the printing of money by central banks. This last extraordinary measure is balked at by government policy makers. That’s partly because they are not sure it will work in boosting aggregate demand as it has never been tried before. It may have unintended consequences. And it’s partly that central bank policy makers like Yellen, Draghi and Kuroda are hoping that the major economies are still going to recover without further measures. And it‘s partly because fiscal stimulus (government spending) is still frowned upon by governments because it means ‘piling on more debt’. Now the Keynesians say that there is nothing wrong with more debt. If it stimulates growth and incomes, then the debt costs can be financed and the debt eventually paid back. So growth through debt should not be resisted. The Keynesians have advocated monetary easing for the last eight years with enthusiasm, but it has failed. Actually, as I have pointed out before, Keynes himself could have told his followers that monetary policy, even ‘unconventional’ measures like QE, would not work in a depression. Back in the early part of the 1930s depression, Keynes thought they would work. But by 1936 when he wrote his seminal General Theory of employment, money and interest, he recognised that just printing more money for banks, households and firms to spend was not doing the trick. It was necessary for governments to spend instead, run budget deficits (more spending than taxing) and borrow the extra cash, in order to employ workers directly and invest in infrastructure like bridges, roads etc to ‘pump-prime’ the capitalist economy. The IMF and the OECD have joined the chorus for fiscal action. But so far, only one government is listening to this call. After its recent election victory in recession-hit Canada, the new PM Justin Trudeau has decided to run a government budget deficit in order to get out the slump that Canada has been in. Trudeau highlighted the importance of infrastructure spending and measures to bolster incomes. “My message to other government leaders is don’t fall into the trap that thinking that balancing the books” is an end in itself, he said. “It’s a means to an end.” So the Canadian government plans to run a deficit of nearly C$30 billion ($22.3 billion) to be announced in the budget next week. But as Trudeau says, it won’t be much “There’s a limit on how much you can flow infrastructure dollars in a short time frame from a standing start.” A C$30 billion deficit would be just 1.5 percent of gross domestic product. That’s a swing of 1.4 percentage points from an expected deficit of 0.1 percent of GDP in the current year. Hardly a big deal. But apart from Canada, no other G7 government intends to widen its budget deficit and spend more (see graph below). Japan has run a huge deficit for the past seven years, but it is also trying to cut it back. Also, in its latest budget, the UK government reaffirmed its commitment to reducing the very high deficit reached in 2009 and turning it into a surplus by 2019, with yet another round of spending cuts. Back in the 1930s, Keynes found to his chagrin that no government would adopt his policy of fiscal stimulus, not even US president Roosevelt with his ‘New Deal’. Roosevelt’s Treasury secretary Morgenthau was wedded to ‘balanced budgets’. So Keynes gave up in disgust. It is an irony of the post-1945 dominance of Keynesian economics up to the 1970s, that Keynes’ main policy plank was never applied by governments in the Great Depression, but only by war economies (and then by the direct control of the capitalist sector). Eichengreen says governments won’t act, and Keynes said the same in the 1930s, because they are locked into the ideology of the past and prejudices deeply rooted in history. These must be overcome “to end the current stagnation”. But is the refusal to adopt fiscal stimulus measures a product of outdated ideology, in other words, stupidity on the part of the likes of George Osborne in the UK or Wolfgang Schauble in Germany? Or is there a rational argument for avoiding running up large amount of deficits and debt by government in trying to get an economy going? Well, yes. 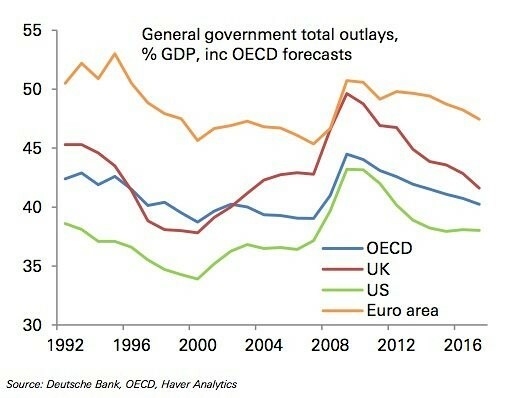 There are unintended consequences of fiscal spending by governments. It is supposed to boost demand and output. There has been much talk and argument about just how government spending would ‘multiply’ output. Views differ but the empirical evidence is not convincing. The experience of Japan also shows that running budget deficits and increasing government spending has done little to restore economic growth there. 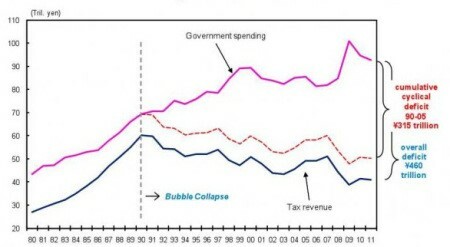 In the 1990s, there was considerable extra government spending and rising budget deficits (graph below), but these Keynesian prescriptions failed to revive the Japanese economy. As I have argued in previous posts, the key to restoring economic growth is investment and that depends on profitability. In a predominantly capitalist economy, raising the profitability of capital has a much higher impact on growth (the Marxist multiplier) than government spending (the Keynesian multiplier). http://gesd.free.fr/carch12.pdf. Indeed, more government spending based on more debt or taxation can threaten the profitability of capital. A war economy removes the problem of profitability. During WW2, debt rocketed but the ‘socialisation of investment’ by governments ensured production went ahead while workers’ consumption was restricted through forced saving for the ‘war effort’. This is the extreme unintended consequence of war Keynesianism. Even if governments heed the advice of the Keynesians and the IMF, short of war, fiscal stimulus will not succeed in restoring growth. Most policy makers in government may be resisting the calls of the Keynesians for ‘ideological reasons’, but the Keynesians are wrong anyway. The law of unintended consequences operates with fiscal as well as monetary policy. This entry was posted on March 17, 2016 at 11:11 am and is filed under capitalism, economics, Profitability. You can follow any responses to this entry through the RSS 2.0 feed. You can leave a response, or trackback from your own site. Michael, have you read any Bataille? I think his concept of ‘general economy’ and excess (the accursed share) are quite relevant to understanding contemporary political economy. He thought the way the excess wealth of a society was used determined the particular form that society would take. In a capitalist economy most of the excess wealth is reinvested in production instead of being wasted in a sacrificial manner as earlier societies did. The Soviet Union took that to the next level and invested all of its resources in production through rapid industrialization, collectivization and restrictions on workers freedom. He believed that workers in capitalist societies who struggle for higher wages are, in reality, increasing the amount of wealth being wasted instead of being reinvested in production. (Which is a good thing from a sacrificial perspective). Under a planned economy, the size of the surplus over worker’s consumption and what happens to it is decided by democratic control; under capitalism by the market. We have to consume and we have to reinvest; the ratio should be a democratic decision. A planned economy doesn’t help man escape the realm of production though. Hasn’t democracy lost its authenticity and meaning in the postmodern world? Except deficit spending is precisely not based on taxation. That’s the whole point. If the government spends €1 then taxes €1 back that’s balanced budget. Also, public debt denominated in the sovereign’s own currency is completely different from household debt. A sovereign government saving in it’s own currency is nonsensical. It’s like saying that a computer saves the characters in a bag when you delete a word from a .doc file. Absurd notion. Surely, easing the tax burden of the working class would have some good consequences. Chartalism is logically more coherent, and historically more accurate theory of money than the commodity theory of money or the quantity theory. The sentence you quote does not say deficit spending but government spending. More govt spending can be financed by more taxation and/or more borrowing. Webb, Interesting debate. Money can be created out of thin air but not value. And without value, money becomes worthless. I have a short essay on Chartalism and Marxist value theory (unpublished). It is indeed an interesting debate. I think most of your rebuttals were addressed in Wray’s and Mitchell’s blogs, though they write so much, it’s hard to keep up. Interestingly they too seem to be aware of the Socially Necessary Labor Time, or at least they think that labor time and the value of the currency is connected. This is why they recommend Job Guarantee instead of Universal Basic Income. “Sorry, folks, but we need an anchor to the currency. It is only worth what you need to do to obtain it. As your wise mom told you long ago. If money grew on trees, it would be worthless. A BIG payment to everyone is essentially the same thing as letting people rake a pile of leaves off the lawn to go buy Beemers. Will the price of a BMW rise? You betcha. “Tie your currency to labor, and stabilize wages in that currency. That will provide full employment with a greater degree of price stability. Well, this is not a hole in Modern Monetary Theory, but one of its main tenets! Taxes drive money. When the state loses its power to collect taxes, the value of the money disappears. It’s strange that Marxist economy shares this basic principle with right-wingers. Saying that with the disappearance of state power people would revert to gold is a classic move from the Mises playbook. Of course, all communists agree that anarcho-capitalism is an oxymoron. Imagining a gold coin economy without hierarchical, legal power structure is pure fantasy. I am fairly certain you agree with this. We have good reason to think that it was state power that gave value to coins in the economy. There never was a market economy without state power providing the framework for it, including the currency people use to trade with. Imagining it is utopian and counterfactual. Before capitalism people either lived in some kind of despotism or some kind of tribal communism. There was no stateless generalized barter economy. Anthropologists, historians and numismatists agree about this. You seem to have read Graeber’s Debt, I found the chapter on The Myth of Barter very convincing. You agree with Locke on p.340, while ignoring Graeber’s history of the events on the next page… strange. Isn’t this the very same as the neoliberal argument against deficit spending? That it will create hyperinflation and crowd out investment? Deficit spending in itself doesn’t create hyperinflation: the collapse of state power and extreme downturn in the national production does. Almost all hyperinflationary episodes were connected to some kind of war. As for crowding out private investment… even if true (which I doubt), is this really a problem for socialists? Again this not a blindspot, but one of the basic tenets of functional finance. I don’t see why it’s incompatible with socialism. Surely even a socialist state has some limits on production! MMTers say the limit is the real resources available (workforce, land, mines, factories, infrastructure etc.). These are the same limits socialism has. It is better than neoliberalism. Full employment is not enough though – the bourgeoisie can always revert the reforms. Just like they did. Deficit spending is not enough, because capitalism systematically tends toward poverty & plutocracy. Moderates have no answer to this. But I think a worker’s democratic state would be eminently compatible with functional finance. The “government budget constraint” is one of the most misleading myths built up by Thatcherites. We need to tear it down. Contemporary Marxists’ beef with Chartalism is baffling to me. I know you have a lot of time for the views of Michael Burke over at socialist bulletin. He has consistently backed Corbyn and Mcdonell’s calls for running a deficit, financed by borrowing, for investment purposes only. He does so again today. Would you reject this move so long as we have a capitalist based economy? Too many left commentators on capitalism do not fully understand Marx. One result is that too many left commentators on capitalism are trying to ride two horses with one backside. The categories that Marx uses do not map to bourgeois economic statistics or data. Equipped with our understanding of the two-fold nature of labour, use value, exchange value, (socially necessary labour time), capital, constant capital, variable capital, the productivity of labour, the rate of surplus value and the rate of profit, we make general observation, below, on the movement of these categories, the movement that creates change in capitalist society. Bourgeois economists /academics have never and can never explain the essence of change. And not just because they are apologists for capital, but because they have no scientific method of analysis. And, as long as left commentators do not apply the thought of Marx, they will continue to be considered a ‘safe-pair’ of hands by the ruling capitalist class. Regardless, as Marx shows, the working class will act in their own interests. One (collective) backside on the one scientific horse is all that is required. Simon, “post modern” is an ideology. There is no such thing as an “ideological world,” though you seem to believe in it, which might explain your disbelief in whatever “democracy” means to you. Reblogged this on Econo Marx 21.
pardon me…scratch “ideological world” from my last post. I meant “post modern world”.